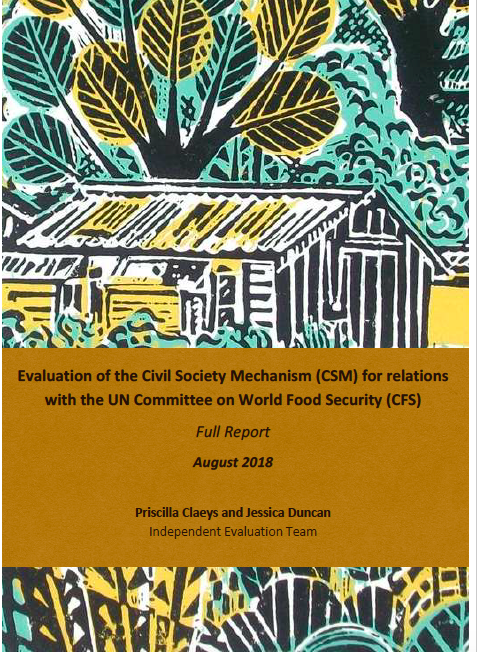 The independent evaluation of the CSM conducted by Priscilla Claeys and Jessica Duncan it’s concluded and the full report is finally available at this link. Please find below the Terms of Reference and background process that informed the process throughout 2017//2018. The CSM Evaluation findings and recommendations were discussed during the Coordination Committee meeting of October 2018 and during the CSM Forum on 13-14 October 2018. Also find at this link a discussion paper on Facilitation prepared for the CSM by Josh Brem-Wilson from the Centre for Agroecology and Resilience of Coventry University (UK) in September 2018, that complements the work of the CSM Evaluation. As foreseen in the CSM founding document, a first evaluation of the CSM was conducted in 2013/2014, and its results were discussed by the CC in July 2014. See the full report here. The exercise was found very useful for the development of the Mechanism, and therefore, a second evaluation was scheduled for 2017/18. The CC meeting in May 2017 had a first discussion on the scope and topics of the evaluation, and the CC meeting in October 2017 agreed on a concept note for its further implementation between December 2017 and March 2018. The evaluation is carried out with the aim of assessing how the CSM is functioning in line with its founding document, guiding principles and mandate and functions. The Evaluation will assess CSM’s strengths and weaknesses, challenges and potentials with regard to three areas: the internal dimension, the external dimension, and “visionary” dimension, as outlined in detail in the section on the scope. The evaluation will particularly look at the last three years, since the first Evaluation of the CSM carried out in 2014. 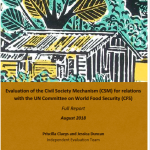 The outcomes of this independent evaluation will provide the CSM with significant insights to self-reflect on the space and move forward to become as effective as possible in its future work in relation with the UN Committee on World Food Security. The CSM internal dimension: the evaluation should look into the internal ways of working of the CSM, the successes achieved and the challenges faced by its participating organizations across the different levels of articulation of their struggles. It should build on self-analysis and self-reflection by those working structures and participating organizations within the CSM which have been actively engaged in the last years, by asking, among others, the following questions: Why do they think it is important to participate in the CSM? How do CSM participating organizations assess their own weaknesses and strengths within this space that articulates CSOs voices into CFS policy processes? Is the bi-directional internal communication flow effectively working in the CSM? What is the perception of the CSM work and its working structures among the CSM participating organizations? Do we use our resources to the most relevant issues, and do we use them in the most effective ways? What has changed since the last CSM evaluation in terms of achievements, issues and challenges? What is needed to improve our internal work? CSM external dimension: the evaluation should also have a critical view of the effectiveness and usefulness of the CFS global governance space for civil society organizations and social movements engaged in the CSM, 8 years after the reform. Some of the questions to be raised in this area are: Are CFS policy outcomes useful to people’s struggles and policy processes that help to improve the living conditions of communities in their territories? If so, what are the key factors? If not, what are the obstacles or missing elements? What are the impediments for the use, application and monitoring of the CFS policy outcomes? Is the CFS addressing the most relevant issues? In how far is the CFS as a food global governance platform a useful space for CSM participating organizations? How can CFS processes be better linked with national and regional food policy processes and governance spaces? CFS in 5 years: a forward-looking vision for the CFS. Some of the key question in this area would be: What is the CSM vision for the CFS? 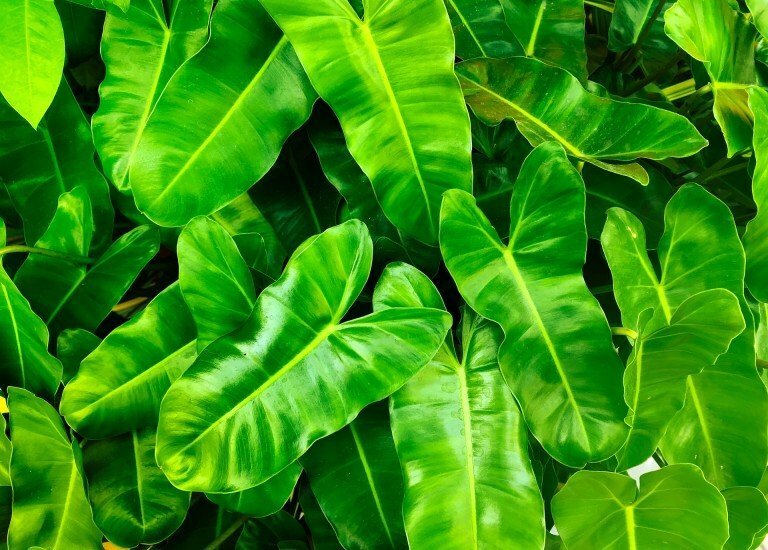 What should the CFS be and become within the next 5 years? What would be the key elements for a CFS that advances towards its vision in line with its roles? How could this development be achieved? What should be the roles and contributions of the CSM when advancing in that direction? CSM evaluators will be requested to propose a possible methodology and process based on these ToRs. It is recommended that a grassroots peoples’ methodology framework should be used and adapted for this purpose. The decision about the selection of the CSM evaluation team will depend to a significant degree on the quality and appropriateness of this Methodology and Process proposal. Additional information: The CSM evaluators should be informed that in the same period, an independent academic team, under the coordination of Dr Josh Brem- Wilson, from Coventry University, will also undertake a research project, with the aim to assess the effectiveness of social movements participation in the CFS. The CSM evaluators might want to consider possible synergies with this research project that is, however, completely independent from the CSM evaluation. The Evaluators will present a first draft evaluation report to the CSM for comments by March ’18. This will be revised as a final version by end of April ‘18. It will include an executive summary of max 3 pages, and will not exceed 30 pages (without annexes). The Evaluators are also free to develop other types of communication tools to share their conclusions. The Evaluators are expected to present the conclusions and recommendations of the evaluation at the CSM Coordinating Committee meeting in May 2018. The available budget for this evaluation is a total amount of 12.000 Euro (taxes included) for the Evaluation Team which would be composed by two persons. Experience with evaluations of policy processes and civil society organizations working in the field of food sovereignty, food security and nutrition, and the right to food. Familiarity with grassroots and people’s centered methodologies of research and evaluation.